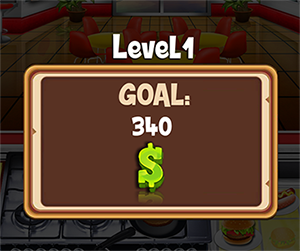 The Level (LVL) represents the Chef Progress you have reached and it depends on the amount of accumulated Experience. 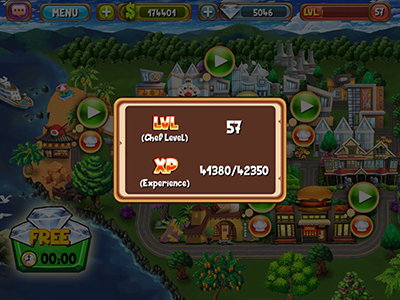 You will need certain Levels to Unlock certain Restaurants or Upgrade certain parts of our kitchen or interior as well as Unlock the "Chef on the Go"
In the example above the current LVL = 13. The Experience (XP) is the number that influences your LVL and it is accumulated depending on how many Customers you serve, how many of them are satisfied, interior and kitchen upgrades. Tap on the LVL top bar in order to Open the popup with your XP details. Diamonds (Gems) are one of the 2 Game Currencies. They are used to purchase or upgrade various objects (boosts, desserts, kitchen tools, ingredients, tables, chairs, sofas, tv and other decorations) as well as unlocking New Restaurants. 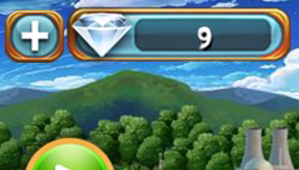 You can use the Plus (+) button on the left of the TAB to Buy more Diamonds. Tips & Tricks on obtaining more Diamonds for FREE. Coins (Cash) are one of the 2 Game Currencies. They are used to purchase or upgrade various objects (boosts, desserts, kitchen tools, ingredients, tables, chairs, sofas, tv and other decorations) as well as unlocking New Restaurants. 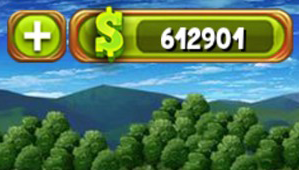 You can use the Plus (+) button on the left of the TAB to Buy more Coins. Tips & Tricks on obtaining more Coins for FREE. This is the place where everything begins. 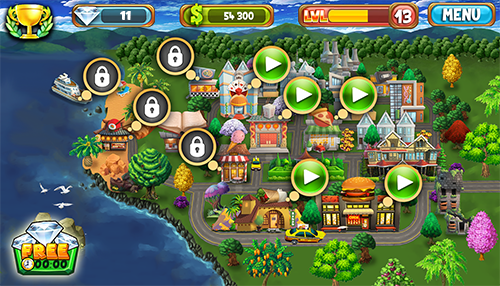 You can start Playing and Unlocking Different "Restaurants" from here, Unlock and Play Different "Chef on the Go", Enter the Casino or Move to the Next Location. 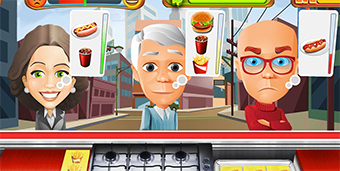 The Cooking Game currently hosts 6 different Restaurants, different cuisines of different cultures. 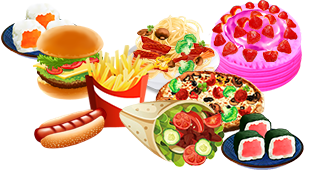 Each of these restaurants tests your abilities and teaches you about various types of food and recipes. Mexican and other new restaurants will be added soon. You can see the Cash Goal Requirement before each Mission and it represents the amount of profit you need to get in order to fulfil a mission. Each Restaurant has 40 playable Missions. They are a suite of tasks that ask you to serve a certain number of Customers, different dishes, according to their requests. Missions differ in complexity: as you go on you get more customers with more requests each. Mission Complete: if you satisfy enough clients you will complete the mission with either 1,2 or 3 stars, depending on the quality and speed of service. Mission Failed: failing a mission means not serving enough custmers - or not reaching the Cash Goal that appears at the beginning of each mission. Tips & Tricks on Completing Missions with maximum number of stars.. These are fully prepared food courses, specific to each Restaurant. You can upgrade the ingredients used for each dish in order to improve it's quality and price. These consist of furniture, entertainment and art objects. By Upgrading these you increase your restaurant stats: Customer Waiting Time, Extra Clients and Tip amount increased. Kitchen Upgrades reffers to ingredients and cooking tools upgrades. These help you increase your restaurant stats: Preparations Time, Portions at Once, Dish Price. By doing these upgrades your dishes price and speed in serving your customers will increase which means you can finish missions faster, with more stars and more profit. 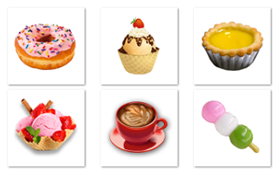 Special Sweets are very useful in obtaining more revenue and satisfying your Customers in normal missions as well as putting your Customers to sleep in "Chef on the Go" mode. You can refill your desserts at any time(10 desserts for 1 diamond). 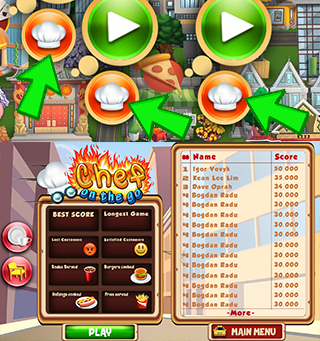 The Happy Meter is specific to "Chef on the Go" gameplay and it is the ratio of satisfied customers and lost customers. 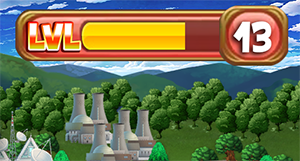 If Happy Meter becomes Fully Red, the Game is Over. This is the special type of gameplay you can Unlock. As "Chef on the Go" you serve people on the street from your Food Van. 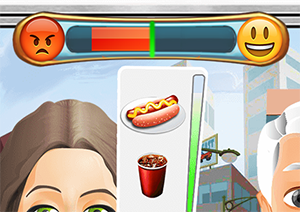 The goal is to serve as many Customers as possible and avoid the Game Over by Keeping the Happy Meter Green as much as possible to get the highest score possible and defeat your friend's scores. This time Customers even sit in Queue so be extra careful and be sure to use the Boosters to help you get higher results. Desserts will put your clients to Sleep in this mode and earn you extra time. More About "Chef on the Go"
Each Restaurant has its own "Chef on the Go" and you can unlock it by finishing the first 15 normal missions. 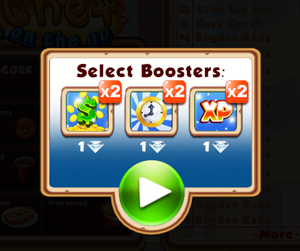 These are Bonus Helpers specific to "Chef on the Go" which can give you a hand in earning bigger Scores. Customers (Clients) are people who enter your restaurant and order certain dishes. As you advance and unlock new ingredients, your customers will start ordering them. You can get a maximum of 4 clients at a time in normal missions and up to 9 clients in the "Chef on the Go"
They are different people with different demands and patience so make sure you do your best in satisfying them and you can receive Tips. Losing many users will cause you to Fail the Mission. Tips are the amount of Cash that Customers pay you as extra for your fast and accurate services. It is influeced by how fast they are being served as long as by certain interior upgrades. Dish Statistic that refers to how much profit you can make from selling it and can be improved through Upgrading certain ingredients (meat, fruits, vegetables, buns, sauces, tea, soda, etc). You will receive bonus Coins and Diamonds for opening the game every day. Make sure to Claim it because the Bonus will increase if you open it daily.